The fifth Princeton was laid down as Valley Forge at the Philadelphia Navy Yard 14 September 1943, renamed Princeton 21 November 1944; launched 8 July 1945, sponsored by Mrs. Harold Dodds; and commissioned 18 November 1945, Capt. John M. Hoskins in command. Following shakedown off Cuba, Princeton, with Air Group 81 embarked, remained in the Atlantic and operated with the 8th Fleet until June 1946. Then transferred to the Pacific Fleet, she arrived at San Diego on June 30, and departed again 3 July to carry the body of Philippine President Manuel Queson back to Luzon for burial. From Manila Princeton joined the 7th Fleet in the Marianas, becoming flagship of TF 77. During September and October 1946, she operated in Japanese and Chinese waters, then returned to the Marianas where she remained until February 1947. Maneuvers in Hawaiian waters preceded her return to San Diego on 15 March. She cruised the west coast, Hawaiian waters, and the western Pacific (1 October-23 December) during 1948. She then prepared for inactivation and on 20 June 1948 decommissioned and joined other capital ships in the Pacific Reserve Fleet. Reactivated with the outbreak of hostilities in Korea fifteen months later, Princeton recommissioned 28 August 1950. Intensive training refreshed her Naval Reserve crew and on 5 December she joined TF 77 off the Korean coast, her planes and pilots (Air Group 19) making possible the reinstitution of jet combat air patrols over the battle zone. She launched 248 sorties against targets in the Hagaru area to announce her arrival, and for the next six days continued the pace to support Marines fighting their way down the long, cold road from the Chosin Reservoir to Hungnam. By the 11th, all units had reached the staging area on the coast. Princeton's planes, with other Navy, Marine, and Air Force squadrons, then covered the evacuation from Hungnam through its completion on 24 December 1950. Interdiction missions followed and by 4 April 1951, Princeton's planes had rendered 54 rail and 37 highway bridges inoperable and damaged 44 more. In May, they flew against the railroad bridges connecting Pyongyang with Sunchon, Sinanju, Kachon, and the trans-peninsula line. Next, they combined close air support with raids on power sources in the Hwachon Reservoir area and, with the stabilization of the front there, resumed interdiction. For much of the summer they pounded supply arteries, concentrating on highways, and in August Princeton got underway for the United States, arriving at San Diego on 21 August 1951. Eight months later, on 30 April 1952, Princeton rejoined TF 77 in the combat zone. For 138 days, her planes flew against the enemy. They sank small craft to prevent the recapture of offshore islands; blasted concentrations of supplies, facilities, and equipment behind enemy lines, participated in air-gun strikes on coastal cities, pounded the enemy's hydroelectric complex at Suiho on the Yalu to turn off power on both sides of that river, destroyed gun positions and supply areas in Pyongyan; and closed mineral processing plants and munitions factories at Sindok, Musan, Aoji, and Najin. Reclassified CVA-37 on 1 October 1952, Princeton returned to California 3 November for a two month respite from the western Pacific. In February 1953, she was back off the Korean coast and until the end of the conflict launched planes for close air support, "Cherokee" strikes against supply, artillery, and troop concentrations in enemy territory, and against road traffic. 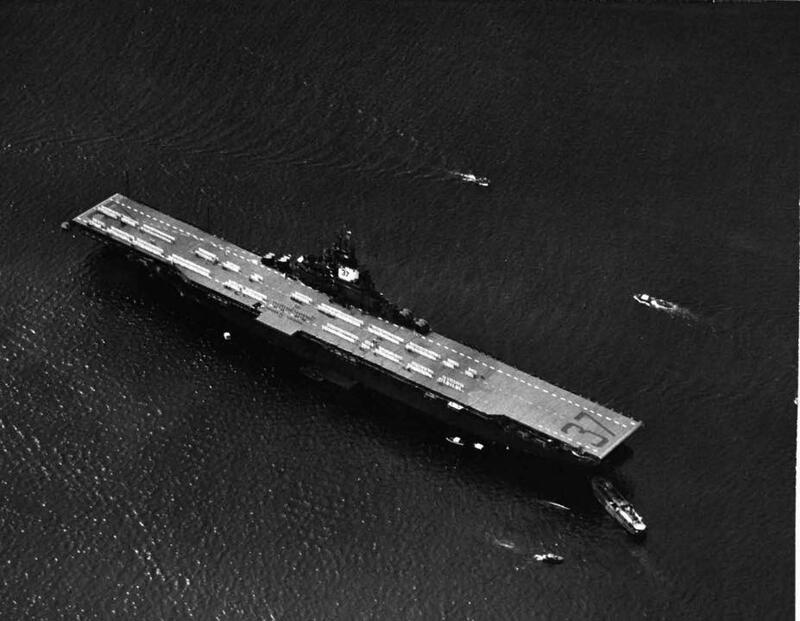 She remained in the area after the truce, 27 July 1953, and on 7 September got underway for San Diego. In January 1954, Princeton was reclassified CVS-37 and, after conversion at Bremerton, took up antisubmarine/Hunter-Killer (HUK) training operations in the eastern Pacific. For the next five years, she alternated HUK exercises off the west coast with similar operations in the western Pacific and, in late 1957 to early 1958, in the Indian Ocean-Persian Gulf area. Reclassified again, 2 March 1959, she emerged from conversion as an amphibious assault carrier, LPH-5. Capable of transporting a battalion landing team and carrying helicopters in place of planes, Princeton's mission became that of vertical envelopment — the landing of Marines behind enemy beach fortifications and providing logistics and medical support as they attack from the rear to seize critical points, cut enemy supplies, sever communications, and link up with assault forces landed on the beaches. From May until January 1960, Princeton trained with Marine units from Camp Pendleton, then deployed to WestPac to train in Okinawan waters. For the next three years she followed a similar schedule, gaining experience in her primary mission. Interruptions came in October 1961 when she rescued survivors of the merchantmen Pioneer, Muse and Sheik grounded on Daito Shima and in April 1962 when she delivered Marine Corps advisers and helicopters to Soc Trang in the Mekong Delta area of the Republic of South Viet Nam. In October 1964, Princeton exchanged WestPac training for the real thing as she returned to Viet Nam and joined the Pacific Fleet's Ready Group in operations against North Vietnamese and Viet Cong forces. Combat operations, interrupted in November for flood relief work, continued into the new year, 1965, and culminated in May off Chu Lai as she carried out her primary mission, vertical envelopment, for the first time in combat. Returning to her homeport of Long Beach after that operation, she transported Marine Air Group 36 to Viet Nam in August, and in February 1966 got underway for another tour in the combat zone. Relieving USS Okinawa (LPH-3) as flagship for the Amphibious Ready Group, she engaged the enemy in operations Jackstay, 26 March- 6 April, to clear the Rung Sat Special Zone of Viet Cong guerrillas, and Osage, 27 April-4 May, to protect Vietnamese in the Phu Loc area from Viet Cong "harassment." Search and destroy missions against Viet Cong and North Vietnamese Army units followed as Princeton provided transportation, medical evacuation, logistics and communication support for the amphibious Operation Deckhouse I, 18-27 June 1966, in the Song Cau district and the Song Cai river valley, then supported 1st Air Cavalry and 101st Airborne units engaged in Operation Nathan Hale to the south of the Deckhouse I area. Deckhouse II and support for Operation Hastings followed as Navy, Marine, and Army units aga in combined, this time to impede enemy infiltration from the DMZ. After Hastings, Princeton sailed for home, arriving 2 September 1966. She deployed again to Viet Nam, 30 January-19 June 1967, and again ranged along that long embattled, highly indented coast. In March 1967, she assisted in countering an enemy threat to the Marine artillery base at Gio Ling and evacuated wounded from Con Thien mountain. In April, she participated in Operation Beacon Star, in the Khe Sanh area, and supported search and destroy operations in conjunction with Operation Shawnee. In May, her helicopters lifted Marines to the DMZ to block enemy forces withdrawing across the Ben Hai river. A much needed overhaul followed Princeton's return to the west coast and in May 1968 she again sailed west to Viet Nam. There, as flagship for Amphibious Ready Group Alpha, she provided amphibious assault carrier services for operations Fortress Attack III and IV, Proud Hunter, Swift Pursuit, and Eager Hunter. In December 1968, she returned to the United States and in April 1969 she was designated the prime recovery ship for Apollo 10, the lunar mission which paved the way for Apollo 11 and the first landing on the moon. On 26 May, Apollo 10 astronauts Thomas P. Stafford, USAF; John W. Young, USN; and Eugene A. Cernan, USN, were recovered by a helo from HS-4 off Princeton after their eight-day orbit of the earth. Completing that mission successfully, Princeton resumed exercises off the west coast. After two and a half decades of service, Princeton was decommissioned and stricken from the Naval Vessel Register on 30 January 1970. She was sold for scrapping in May 1971. Princeton received 8 battle stars for service during the Korean Conflict.